Finally a stainless steel, rather than plastic, canning funnel. 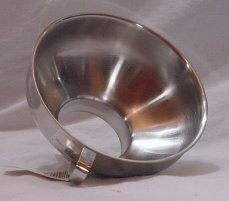 Wide mouth - 5 1/2" funnel diameter with a 2 1/4" mouth diameter. This fits both wide and narrow mouth standard, mason type canning jars, and has a hopper capacity big enough for easy filling of your jars. It is also great for directing your dehydrated fruits, vegies, and herbs into storage jars. It sure is nice to have a stainless steel option available for these tasks.